On 27-28 November 2018, a national seminar on “ National Seminar on Research Trends in Cognitive Radio & MIMO Communication System” was organized by the Department of Electronics and Communication Engineering, Sponsored by Dr. A P J Abdul Kalam Technical University. 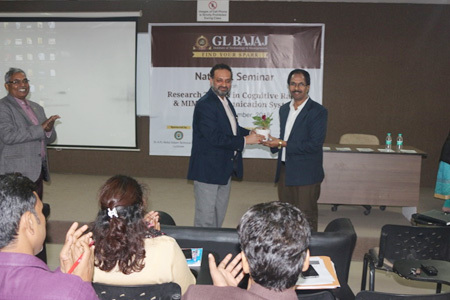 On 27th November at first Dr. Stayendra Sharma, HOD, ECE welcomed the guests and then the Inaugural Talk was delivered by Dr. Rajeev Agrawal (Director, GLBITM) on “Advance Networks Generation Aspects”, during which he discussed about Cognitive Radio and Green Networks. Then the guest of session Dr. S. Srinivasa Rao, Professor and Head, ECE, MRCET, Hyderabad was invited to start the session. His session was on “Recent Trends in Cognitive Radio”. The session was mainly focused on the practical aspects related to cognitive radio. Third session of the day was taken by Dr. Jugul Kishor, Assistance Professor, NIT Delhi. Title of his session was “MIMO Antenna for 5G Applications”. He discussed about MIMO techniques and antenna design aspect. On 28/111/18 Dr. Amit Sehgal (Associate Professor, GLBITM) started the first session on “Mobile Broadband QoS” and then the next session was handed over to Dr. Stayendra Sharma, HOD, ECE, GLBITM. His session was completely focused on Mobile Network Planning. Last two sessions of seminar were on Telecom Infrastructure- 3G to 4G and Next Generation Networks by Mr. Abhishek Gupta and Mr. Anil Kumar, ALTTC, BSNL, Ghaziabad. Both the sessions were full of practical information. Whole seminar was very informative and interactive. 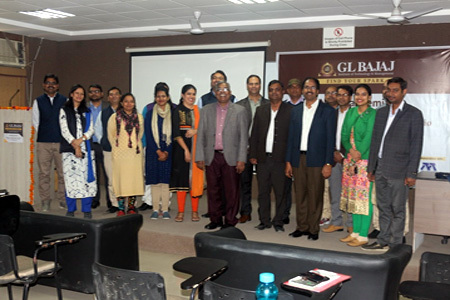 These sessions were attended by approximately 50 faculties from different colleges and departments.